"… to be able to Twelfth Step ourselves and others into emotional sobriety" — living, loving & letting go. I am searching for a new way of sharing the experience, strength and hope of our group. Initially, this group was created to be a workshop with weekly writing assignments. However, over time, we have evolved and become less structured. Our discussions are so rich and deep! I thought I would share some of what we discussed during our recent meeting on the AA Big Book story, Window of Opportunity. 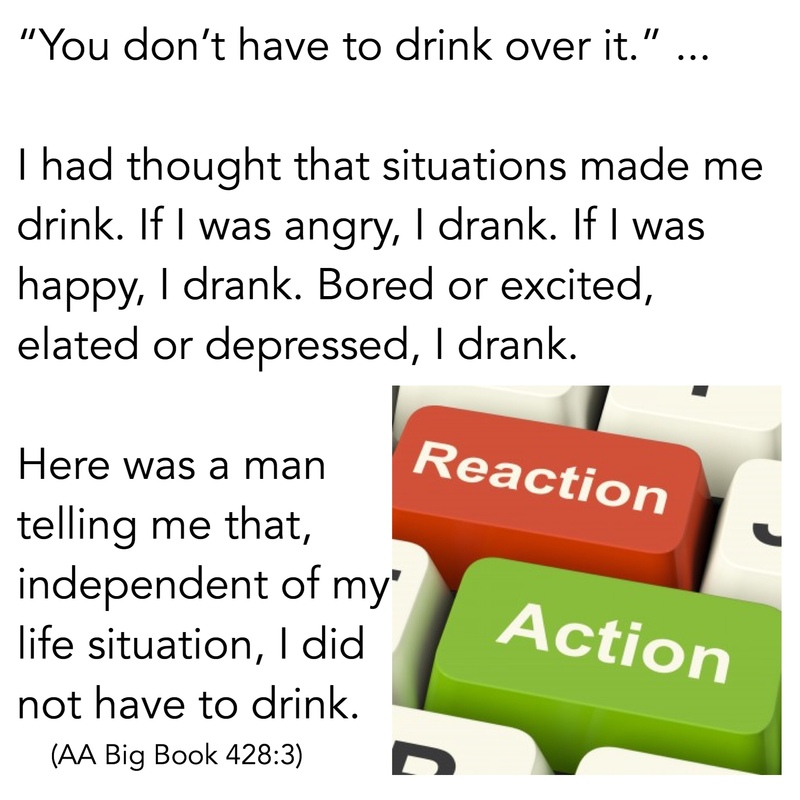 I am really enjoying how the stories personalized how to work the program and recover from addiction. There were certain sections of the story that really resonated with the group. As a reminder, our group takes place on Sunday mornings at 5:30 AM EST. It sometimes requires a conscious effort to remember how much our lives have improved through program and by working the steps. True joy and happiness comes from striving to live a God-centered life, in constant conscious contact with the God of our understanding. When we work a program of recovery, we surrender our natural desire for instant gratification for something that is deeper, more long-lasting and pure. This process of growth and change is not the quick fix of instant gratification. Connecting to our inner essence is a slow and quiet process of unfolding and gently revealing who we really are. This quote tells me that independent of my life situations, I have a choice whether I pick up the food or not. Anyway, turning to the food will not change my situation. It will really only make me fat, and I am still going to be stuck with my original problem. This quote also tells me that I do not need to spend the time resisting what it is, because, IT IS WHAT IT IS. I am not in control over what happens to me. But, I am in control over how I respond to what happens to me. Therefore, I am always responsible and accountable for what I do and what I say. 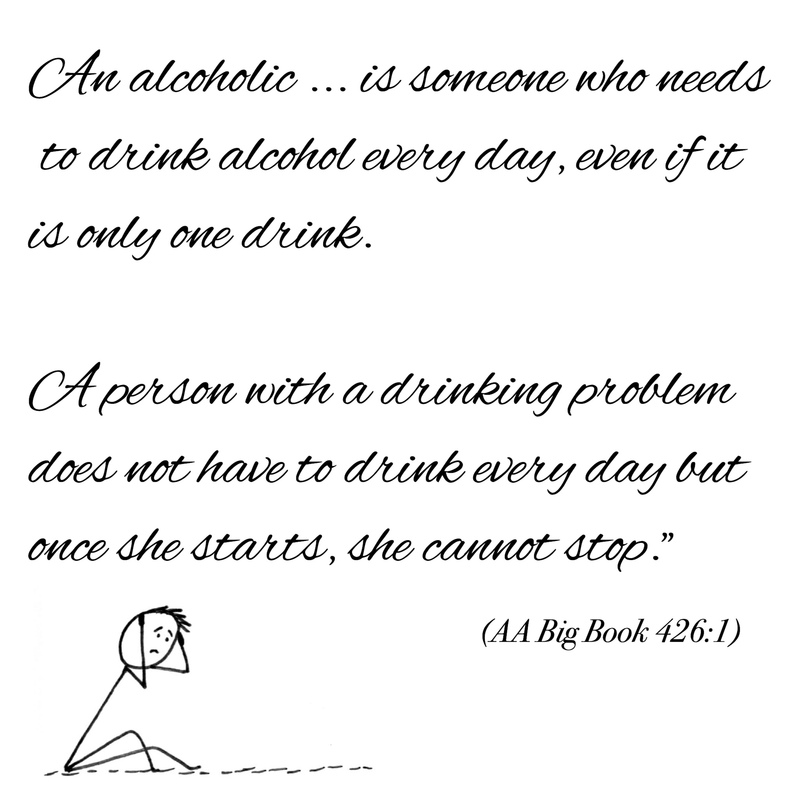 This quote shows how people apply the steps and the principles of the program into their lives in order to recover. It is also a great a description of how we seek to transform our self-centered defects of character into God-centered assets. Here too, we see an indirect reference to the 4 Absolutes as well. During our meeting, we discussed the growth and transformation that occurs from self-acceptance. 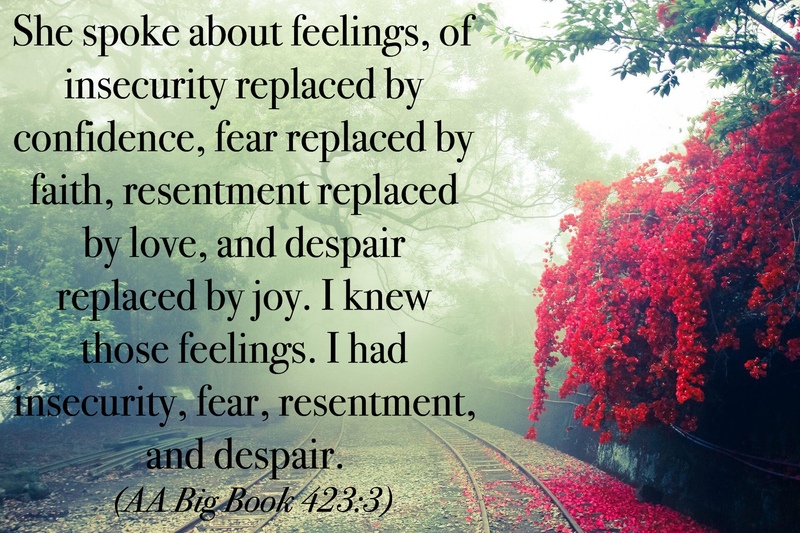 Shoshana shared with the group a beautiful explanation, which I paraphrased of the above quote. “Before program, I turned to food to cope with life. I had so many unrealistic expectations of others and also of myself and how I should be. 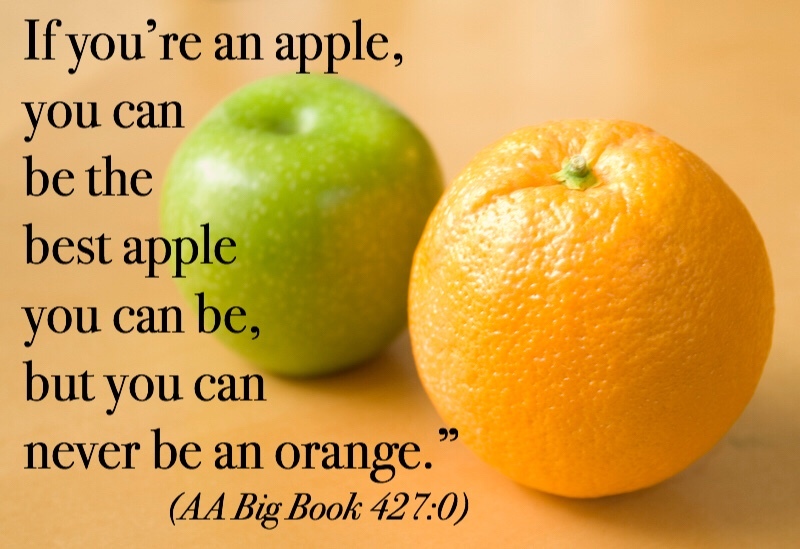 I always thought that in order for me to be a successful, worthwhile and competent person, I had to be an orange. I always say, “If God wanted me to be different, then I would be different.” God does want me to rise above my instincts and to freely choose to act as He would have me be. That was an incredibly powerful question for me to consider and write on. If God is everything, then everything is ultimately good, under all circumstances. I just do not necessarily have the clarity of vision to see just how good everything truly is. I am limited by what I like or dislike. If God is nothing, then my situation is hopeless. I am stuck. I have already proven to myself that on my own, I cannot change. When I live in the world according to Shira, I am chronically dissatisfied and a size 20. I can have no inner peace. My judgements and desires block me off from feeling connected to God. Judy shared about the line in the story where the man who wrote that he was so determined to decide for himself how he was going to work this program. The elimination of our compulsive overeating is just the beginning. As we have discussed many times, our food is but a symptom. Working the steps in an ongoing moment to moment way of being. Every moment, no matter what we are doing, is an opportunity to connect to God and do His will. Please let me know if it is helpful to post some of the notes from our discussions. Looking forward to seeing everyone tomorrow morning! Thank you for your words – they express what I am feeling and thinking. Your words help a lot! Thank you for your words. I ask God everyday what I should write on this blog and that it should be helpful and of service to others! We are fully self-supporting through our own contributions. Thank you for your support! "...to be able to Twelfth Step ourselves and others into emotional sobriety" - living, loving & letting go.